This past weekend I had the pleasure of attending the Coachella Music Festival in California. It was an amazing adventure with some good friends. The question I keep trying to answer is: "Who was the best show?" And there really isn't a clear answer. Festivals are not like the concerts for I normally write reviews (disclosure: the reviews are how I get paid!). The atmosphere, the venue, the scheduling, everything about a festival is different than attending a regular concert. Concerts have a single headliner that attracts and to some degree homogenizes the crowd. The point of a concert is to build the audience up for the headliner, give them a ride through the big performance, and then usher them out the door sated. Festivals don't build and peak and then stop. They build and peak, build and peak, and build and peak. They are an endurance race, compared to the sprints of a single show. The best experience for me then was sitting on an overlook dancing to Tiesto. It was after Muse had played and at the end of a very long, very satisfying day. But the crowd definitely peaked. When the beat dropped, the crowd was illuminated for one long moment and this seething mass of gyrating bodies simply exploded. From where I stood I felt the music crashing through my bones and the only thought my mind could hold was that finally I understood the definition of bliss. Of course, Muse was amazing and Jay-Z was fantastic. You don't go through either of those experiences without being changed. The cathartic chanting chorus during Uprising went beyond inspiring becoming an irresistible force capturing the crowd. Every line that Jay-Z rhymed tilted the world and righted it again in a single breath. There were many other notable experiences and I learned a ton about the proper way to enjoy the festival, providing a whole new chapter for the upcoming World Experience & Travel Guide. No write-up would be complete without a shout out to my good friends D & C who made the weekend more than just fun, they made it truly unforgettable. You guys are the best! I've written before about being faced with new relationships. Shenanigans amongst my friends recently reminded me to expand this post to cover how different friend types also impact on-going relationship decisions and difficulties. Your friends respond differently for new prospects then for prospects that are turning sour, for when relationships that should be dead, linger, or when the relationship you thought was dead, shows a spark of new life. We all have that friend who is just laser-focused on pointing out that the alcohol-soaked napkin with the lipstick-scribbled number of your latest Saturday night crush on it, should really be lit on fire. As you unfold more and more of the tidbits your booze and make-out influenced investigation have gleaned, they are ready and waiting to call foul and throw in the towel on your behalf. They might genuinely be looking out for you, but more likely they're just cynical because they haven't had enough lip-locking of late and this new contender could never possibly measure up to their version of The One. Having a few of these you can check in with from time to time will often balance the scales of your hopped-up libido. On this one, I am guilty as charged. We like to smell the freshly laundered sheets and we think that the latest 8 word text from a lost love is a sure sign you are getting back together. Like many out there, I want to believe that things will work out for my friends and that each new prospect has a shot at the big Happy. This is partly why people like myself need friends out there who are cynical and who are quick to slam down the eject button. The hopeful ones out there like me thrive on sunshine, the power of a wink, and the idea of The One. And we'll wear our gleeful little love blinders over each new relationship speed bump as we totter on our merry way. A big challenge of course is that we don't want to get too wrapped around a particular conquest that we can't see The One that is right in front of us. This is the stuff that RomComs are made of and until I land in one, I'll value my friends who aren't quite so fluffy as I. We all have friends who simply don't listen, or in some cases, don't actually care. They might just spout our own words back at us, parroting what they think we've already decided. They might not be listening, or they might be apathetic and self-absorbed. Regardless, they keep us ignorant and our wanderlust then goes unchallenged. In some cases, they might actually spur us towards silly choices simply because the faster things go awry the faster we'll be back under their wings with the status quo preserved. They are ignorant of our happiness, and perhaps a little sad. So whether they are hoping to salve your wounds by allowing or even encouraging rash behavior, or they are just mindlessly mirroring, neither is helpful. Not that we all can't use a cheer-leader from time to time. You can certainly find yourself playing one or more of these roles as the seasons change, and no doubt see these traits in your friends when the light hits just so. It takes a balance to do the dance properly and without the pull and push of these conflicting perspectives, where would we find all the drama that makes happy hour so interesting? On this special day I went with friend to see a favorite band of mine. The opener was Say Anything and they were super fun. I hadn't heard them live before. 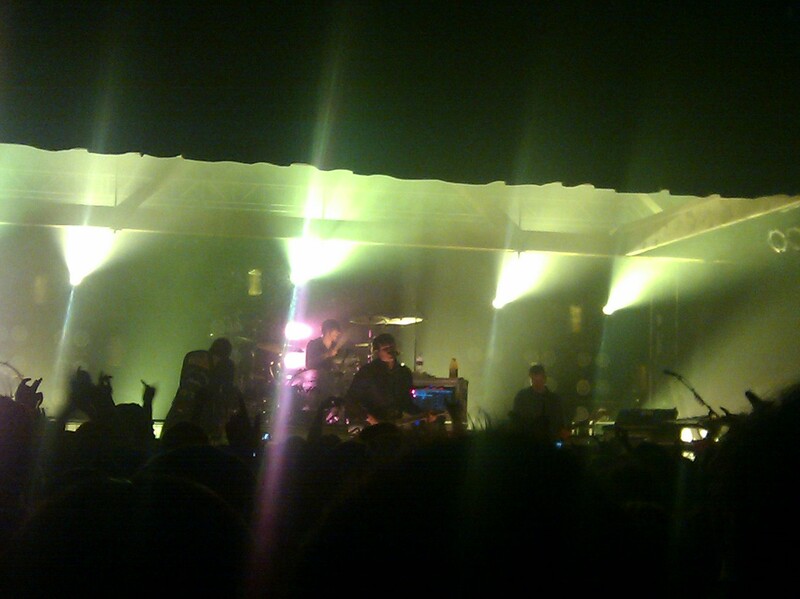 Angels & Airwaves did bring the crowd to a boil though. They have a loyal following and it's for a reason. They rock. The live versions of A Little's Enough and Everything's Magic were simply amazing. A great way to spend a special evening. I wish I had an excuse for this one. . . But I don't.